Tashi, you are one of the greatest living artists today.. Exquisite, subtle, multi-layered, sensitive, powerful.. It's all there. For me, it inspires me to reach these kind of levels in my own work. 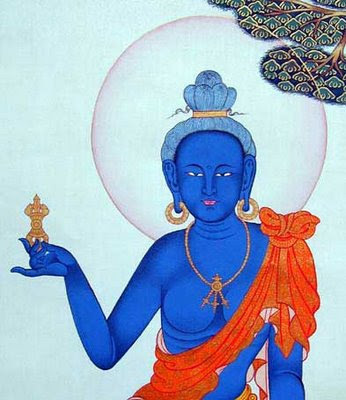 So, the peaceful form of Vajrapani is female? Those are definitely breasts! Beautiful work. Gorgeous works. I had a spontaneous vision of myself as a red meditational deity earlier this year. A voice in my head said, "Vajrapanni." I'm still not very stable in deity yoga. Thanks for the images and mantras. por casualidad encontré esta página web hace un tiempo y me maravillé con tan lindos dibujos que hay aquí. 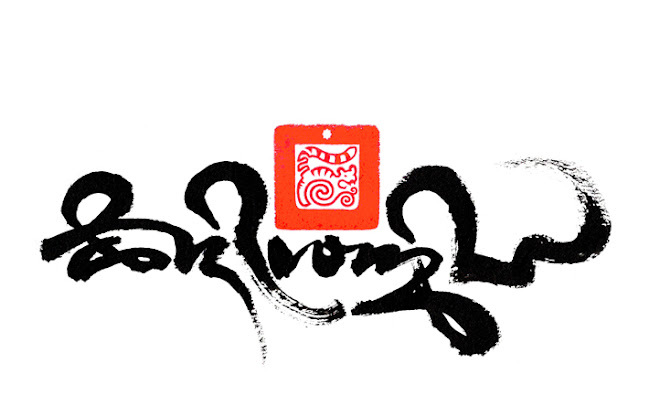 el mantra de vajrapani dentro de la estrella lo tatué en mi espalda, porque su significado me llegó mucho. te admiro, eres un gran artista. It is fascinating how many depictions of ancient deities are always not human, or in humanoid shape, I think that ancient knowledge withhold some secrets that are not been revealed. Your art is extremely beautiful. I personally do Islamic calligraphy, would be willing to share what kind of calligraphy pens and tools you use? 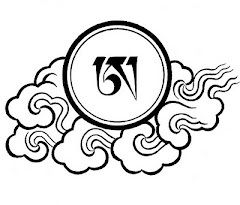 Hi Tashi, I am following Kagyu lineage for the last 20 years and I quite like tattoo body arts but have not inked any yet and that is something I wanted to do for a long time but consider the reasons to and not to, however I am pretty attracted to the Kagyu Tiger Thangka-like you have created. I am thinking of putting as tat on my back, slightly near the waist with the three hum syllable slightly rise above the waistline. I do not know if you allow the picture of your art to be 'canvassed' on people's body who loves your art especially the "Kagyu Tiger" icon. If you wish to use the Kagyu Tiger image i created, it will need to be made suitable for a tattoo design, as the original artwork is predominantly black and will not copy clearly when the transfer templet is made for the tattoo. You will also need a good sharp high resolution image, as only a good tattoo comes from a good clear original. A beautiful work of art! 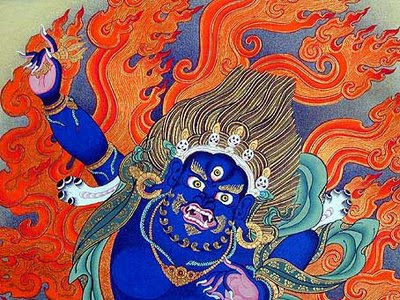 And thank you for the detailed information about Vajrapani.